Adam Koziol is a photographer from Poland born in 1991. 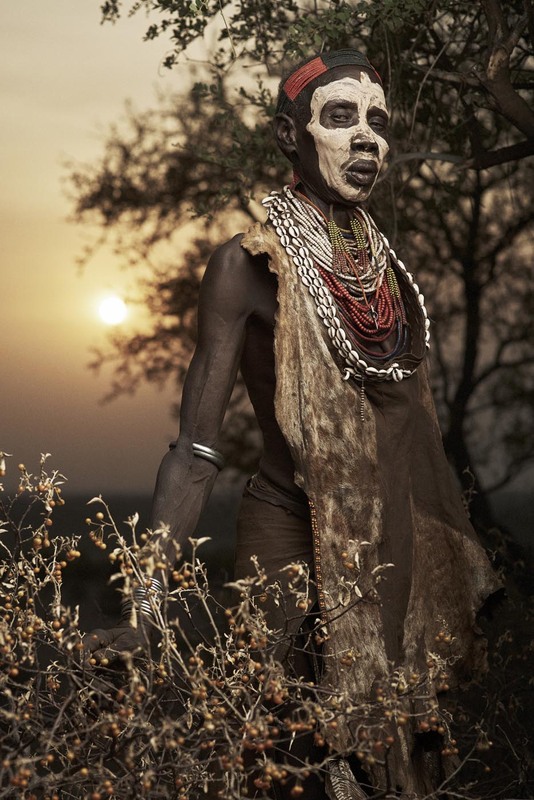 Since 2013 he travels the world to find tribes and it is at the age of 27 that he gives us a series of photographs of 18 different tribes. He answered our questions to explain his love for the culture of the endangered tribes. How did you become involved in photography? Can you tell me a bit about yourself? I started photography by taking photos of tropical insects. Since I was 12, I started cultivating insects and this was my first contact with photography. I was spending much time learning. When I was 16 and had quite a big collection of insects, I decided to go with an adult friend for a trip to Borneo. It was a landmark moment in my life, as I discovered my passion for traveling, discovering – documentation of insect made even more sense to me. I documented a lot of very rare species, some, in the form of eggs, were brought to Poland and I could start cultivating species that are not available in Poland. This was an important trip for me also because the income from my cultivation could be spent on next trips. Half a year later, I went to Sumatra where I was able to find a new species. This was an insect from the Haaniella family which included only 6 species. From then on, I started traveling regularly, sometimes even 7 times a year. Can you tell me how you first got the idea for this project? My most frequent destination was Borneo – a mekka among insects which I was most interested in. At every place on the island – in Sarawak, Sabah and Kalimantan, I found many rare species. I photographed and placed on forums for insect cultivators. In the Sarawak part, I often heard about the culture of Iban headhunters. From one person I bought tribal masks from, I heard that there are still elderly people with authentic tribal tattoos on shoulders, so-called Bunga Terung. This inspired my imagination, as such tattoos were received by people who were characterized by exceptional courage, participated in battles with other tribes or brought an enemy’s head to their tribe. This was the culture of headhunters. I was fascinated by meeting those people. The first time I decided to change the objective of my journey and in 2013, with my Malaysian friend, we decided to search for the last tattooed members of the tribe. We reached one of the parts in Sarawak where Iban tribes lived. Currently, they are peaceful villages in the middle of the jungle, longhouses in fact – long buildings in the jungle, housing more or less 15 families. For three weeks, we have been visiting longhouse after a longhouse, traveling by motor scooters or, in more difficult terrains, on foot with a rucksack. For me this was also an amazing – different adventures in comparison with looking for insects at night. 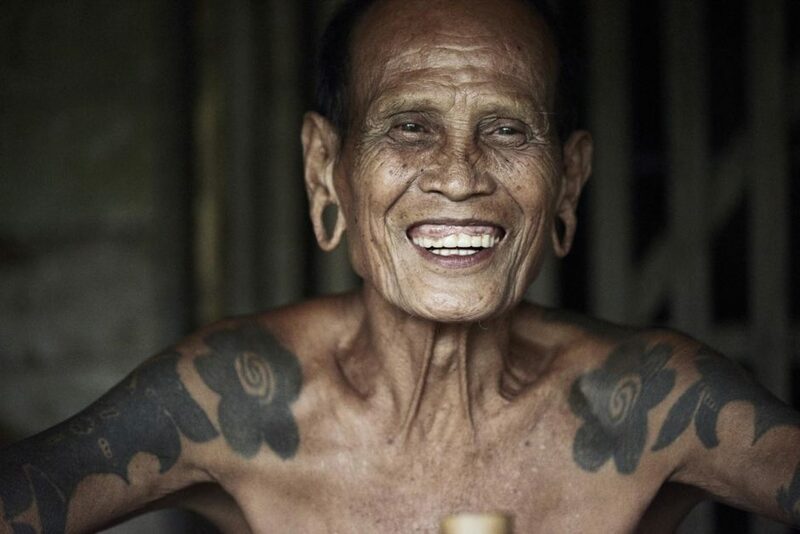 In one of the longhouses, we managed to find three elderly men with tattoos all over their body. This was an amazing experience for me, as while talking with them, I was aware that I was probably the last person to be told all those stories. They were more or less 90 years old, one was in their 70s. I remember a moment when one of the men took of his T-shirt and I saw his entirely tattooed body. I made a photo report and interviews with these people. On my way back in the plane, I was thinking about the plan for the second trip to look for more people in that region. After returning home and analyzing the situation in the world, I realized that the condition of most of the tribes is similar. 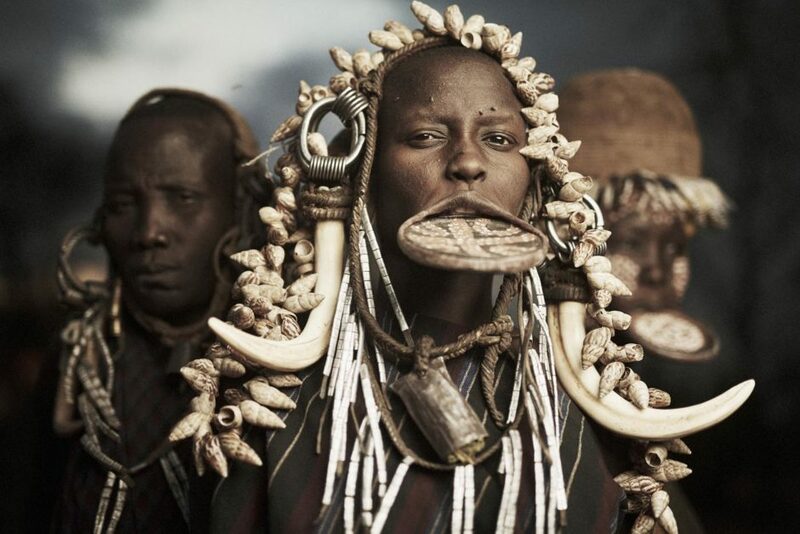 Often, they are the last people left, and their tribal identity is proven by their tattoos and scarifications. It is them who might tell the story of their life, their culture, which will become history upon their death. Another destination were not insects, I started to go and document people and their culture. The cultivation of insects was my main source of income which allowed me to finance my trips. I was wondering what I could do in order to earn by documenting the tribes and continuing with the project. It was not possible to do both things at the same time – documenting tribal cultures outweighed the insects. I decided to create a clothing brand named Selva, in which I designed t-shirts inspired by the cultures I met. This was a good decision that allowed me for the next trips. In order to develop in photography, I opened a photo studio where I can work on everyday basis and develop my skills. Please describe what we see in your images in your own words? I would like to show the beauty of the cultures, the variety of origins of the people all over the world. I am fascinated in particular by tattoos, scarifications and other individual features identifying a given tribe. I am also interested in characteristic phenotypes of all societies and external attributes such as clothing, jewelry, arms. I am trying to develop relationships with people before making any photo and I spend as much time as possible on peaceful talks. Time and getting used to one another results in me knowing what to do and, more importantly, in those people feeling comfortable. How were you able to take these incredible shots – can you tell me your method? I love portraits and I am trying to master the light. What helps me is studio lighting I take for every trip. It is really a big logistic undertaking, since usually the luggage is up to 65 kg, but then I can control the light. I used to travel alone, since then I felt that I was making more meaningful relationships with local people, but for some time, I have been traveling with my wife who helps me in many aspects and I am able to do much more. Were there any problems you had to overcome? Logistics, logistics, logistics… Reaching the destination takes most time and finances. On site, apart from several exceptions, I met with much hospitality. Once, in Papua where we had to reach Yali tribe to one remote village where were many elderly people with traditional clothes with Koteka. I had 5 porters and one guide/translator. There was 5 days walking. After one day guide told me that we will not reach this village because porters are too week and they need more money from me. I had to resign from them, I paid them much money before the trip so it was my mistake. They went back to the city and me with my wife went alone. It was one of the most difficult situation for me in many aspects. Another time I had to pack at night and leave a certain village in Ethiopia, as there was a serious alcohol-induced fight between the villagers, ending in gunshots. I had 3 serious food poisoning, after one of them I was so sick that I was not able to contact anyone. Apart from that, I hope that I would not experience any more serious trouble. In most cases, it is very safe. What do you love about this type of photography? Working with people, knowing their life stories, in the context of culture. The adventure of reaching the tribe and being there. Equally fascinating is planning photoshots. In Poland, I am trying to learn about the culture, I am planning how to present it, I am sketching the shots. I mostly manage to do more than planned, but I probably end every of the trip with no full satisfaction. There is always something I did not do, which I might have done, or I have a certain idea and regret I did not do it with another culture. I am recording all of my thoughts in a simple application and I recall them during the next trips. Each trip is very developing for me and perhaps this is why it is so fascinating for me. Is there a particular message you want to convey? I am presenting an authentic story of people and leave it for individual consideration. I do not have any message to convey with the project. Every person has a different story and for me, this is the most important thing in the project. I also focus on aesthetics. I choose the tribes that fascinate me with their cultural beauty and I would like to present them. I would like to create photos that are not to be viewed in 2 seconds and forwarded further. I would like to create images that are analyzed by people for some time. What are your thoughts on the fact that tribes will soon be a thing of history? This is my strongest motivation. I know I will not be able to do certain things in 5 or 10 years. 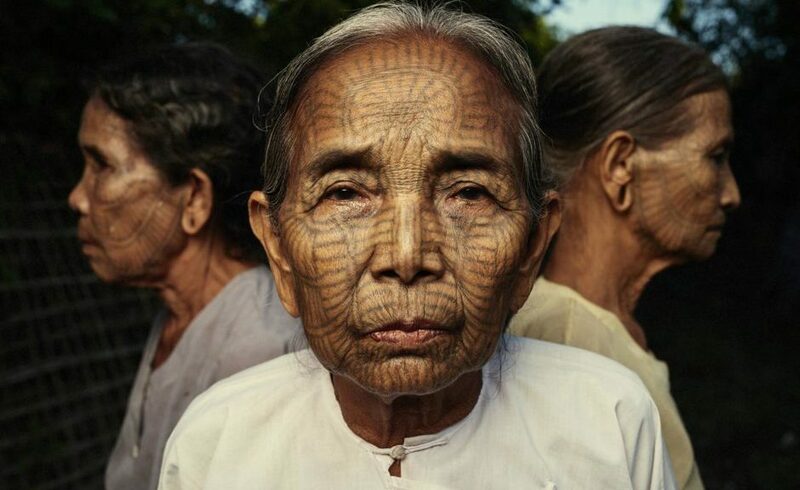 For example, during my last visit in Taiwan I managed to meet the last two Atayal women who have faced tattoos. One of them was 103 years old and the other one 108. The younger woman has died this year. It was a great experience for me when the family asked me to send them her photo so that they have Iwanu’s picture at the funeral. I felt that the huge centuries-old Atayal tradition, one of the biggest indigenous tribes in Taiwan, was dying during a small funeral ceremony being forgotten in nowadays civilization. In November she was still a cheerful woman with a sharp mind. She was talking about the story of her life and culture. If I visited Taiwan next year, it would be too late. Which of the tribes left the biggest impression on you? I think it was the first tribe I managed to take some pictures of – the Iban tribe left the biggest impression on me. It was a flashpoint. Apart from all this, it was a great adventure for me to be around the Mentawai people in Siberut island next to Sumatra. It is a unique shamanic culture shrouded in mystery. I felt amazingly good in the Konyak tribe in India, the culture of the former headhunters, who converted to Christianity and chose love. Incredible faith, authenticity and openness towards people left a big impression on me, which in turn, gave a lot food for thought when I came back home. 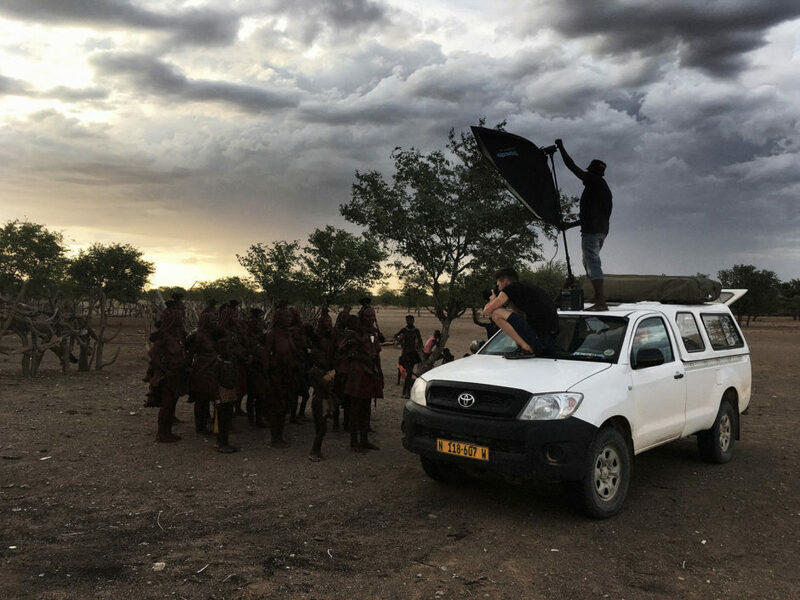 The Mursi and Himba tribes were the aesthetic individuals for me; however, it was difficult for me to make a closer contact with them and have a peaceful conversation with these people. In Indonesia on Papua the biggest adventure for me was to reach the most remote villages and look for people wearing traditional Koteka. The most valuable for me is the fact each tribe brings to mind different emotions, different stories and each place taught me a lot of new things. Would you live outside of civilization if you could? I would definitely not. Although I am planning to build a house in the woods, with no other buildings within the range of 4 km, I think my life and work wouldn’t be good if I lived outside of civilization. However, I have always dreamed of landing on a desert island and having to survive there for half a year. It would be a challenge! Where are you going for the next tribe series? I am trying to get an entry permit to the territory of Zo’s tribe in Brazil. It requires a lot of permits that my friend from Rio de Janeiro is helping me to get. He got fascinated with the project and is willing to participate in it. I hope we can make it. What’s more, I am planning to visit Dulong women in China and above all, to open a chapter of Papua New Guinea where there are over 100 tribes living and cultivating their traditions. Before we wrap this interview up, could you share an anecdote on the story of a tribe you met? Legend has it when the Burmese king traveled to the area inhabited by women from the Chin tribe, it left such a big impression on him that he kidnapped one of them. That is why, Chin families started to make tattoos on their daughters’ skin to make sure they would never be kidnapped. In fact, girls between 12-14 years of age have their faces tattooed and their ears pierced so that they could wear bigger and bigger earrings in order to become a part of the tribe. This was a symbol of feminine beauty but it also prevented women from being kidnapped. It was a really painful process especially in the area of eyelids and it usually lasted one day. The tattoos are made with the use of leaves, grass shoots and soot and the mixture is put on the face with the use of sharp cane thorns which injure the skin to create a pattern on it. In the sixties Burmese socialist government put a ban on this tradition. 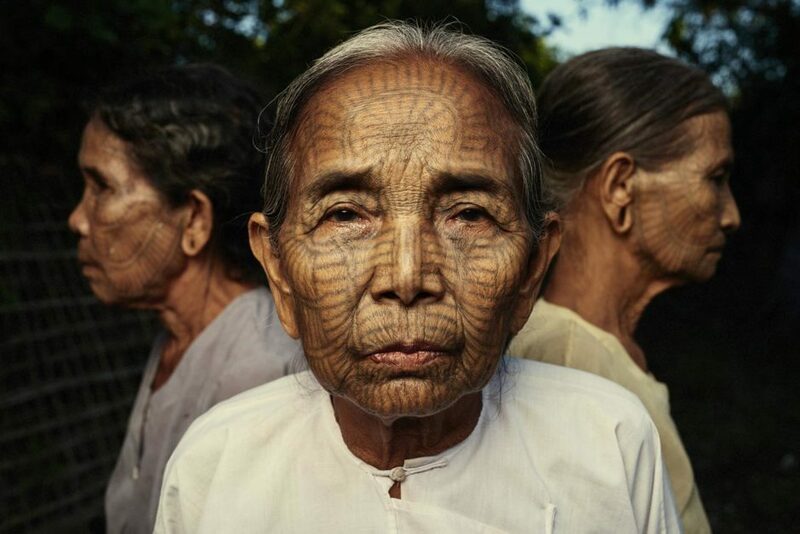 Women in these pictures come from the last generation who have their faces tattooed. There are few types of Chin tattoos. I have reached and document 3 types. Thanks to Adam Koziol for answering all our questions. You can find all his photos about tribes on his website. Find all my work in Phototrend.